I pride myself on my recipes being something that even an inexperienced cook could pick up and turn out great results. 99% of recipes on my blog are exactly that. If something is quite complex, I weed out the problem areas, finding alternatives for you until it’s manageable. 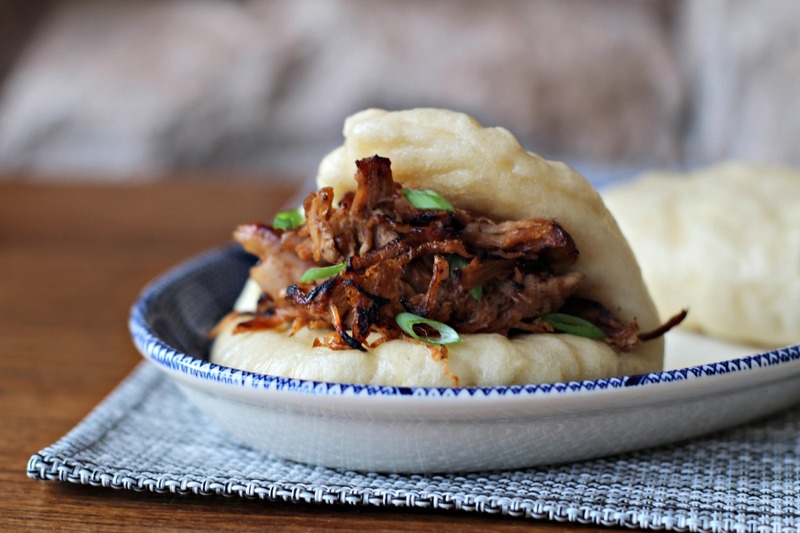 This Char Siu Buns recipe however, is purely self indulgent. Matt loves them, I adore them and although the recipe is fairly hands off, the steps take place over 24 hours. I’ve got your back though. I know a lot of people avoid anything that needs that much forward planning, so I’ll give you two ways to make the char siu pork; the real deal and the sneaky cheat. 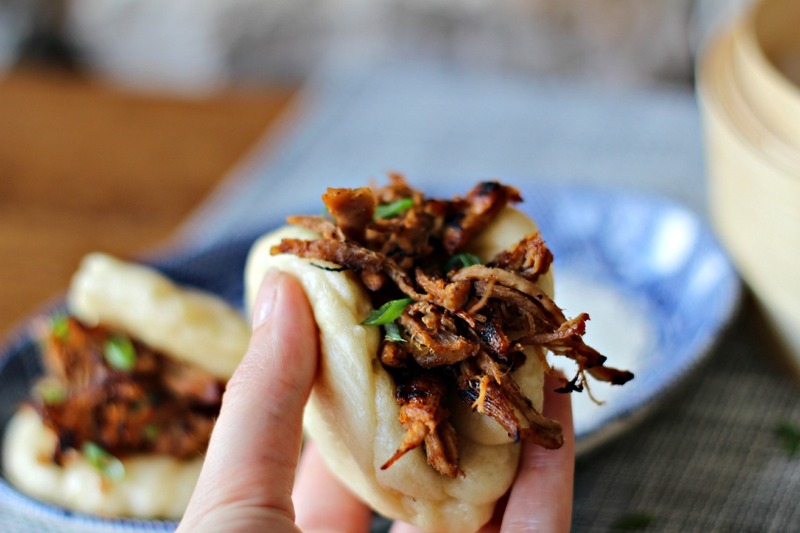 Same for the bao (buns); a from scratch version and something easier. Whichever way you choose to do it, these buns area heavenly, smooth pure white dough holding the key to my heart. The Char Siu pork is just incredible, you’ll impress your guests with this, but to be honest, it’s almost too good to share. I tested the water with this recipe on my Facebook page, and y’all went crazy! So let’s do this. Rub the five spice in to the pork shoulder and transfer to a large ziplock bag. Mix together the honey, rice wine, garlic and hoisin in to a thick paste then let down with the soy sauce. Pour the mixture in to the bag with the pork and seal. Leave overnight in the fridge to marinade. Preheat the oven to 150 degrees Celcius. Place the meat on a rack (or tinfoil balls) in a roasting tin with 1cm of water in the base. Cook for around 4 hours or until the pork comes apart easily with two forks. Keep the bag of liquid and baste the meat with a ladle of it every half an hour whilst it is in the oven. Once the pork is ready, shred with 2 forks. At this point, the pork can be frozen or kept in the fridge for 3 days. When you come to serve, just fry it off in a hot dry pan until the edges of the pork begin to brown and it’s piping hot right through. The cheat: Pick up a good quality pack of barbecue seasoning, like the Flava It marinade (75p in Tesco at the moment) and mix with 3 tsp of five spice. Roast or slow cook the pork using the directions above and then shred the pork. Once shredded, mix the seasoning with 2 tbsp water and combine with the pork. Fry off in a hot dry pan until slightly browned. Obviously this isn’t a legitimate char siu, but it’s good and distinctly reminiscent of the real deal for those that just don’t have the time. Mix together the yeast, water and lard, stirring until the yeast has dissolved and the mixture is cloudy.Combine the flours, sugar and salt in a large mixing bowl, adding the yeast liquid bit by bit and mixing until the dough comes together.Knead the dough by hand for around 15 minutes of in an electric mixer with a dough hook for 8 minutes. Turn in to an oiled bowl and cover with cling film. Leave in a warm place until doubled in size (about 2 hours). Punch the air out of the dough and shape in to a log and cut in to about 25 pieces. Shape in to golf balls. Using a rolling pin, press the centre of the ball and roll up and down until a flat oval is formed. Brush the top of the dough with a little sesame oil and fold in half. Transfer to a lined baking sheet, cover with cling film and leave to rise for another 40minutes. If you don’t have liners for your bamboo steamer, cut squares of greaseproof paper to go under each bun. Lay as many as you can fit in each basket with a little space to expand. Add 2cm water to a wok over a high heat, rest the bamboo steamer in the base of the wok and steam for 8 minutes. The cheat: You can actually buy pre made dough for these buns from asian grocery stores or alternatively an instant mix that just requires water. Will they be as good as home made? I doubt it, but it saves a lot of time if you don’t have the patience. Enjoy your char siu buns with finely sliced spring onion. Yum! Never made my own char siu buns before.. but I sure love eating them. 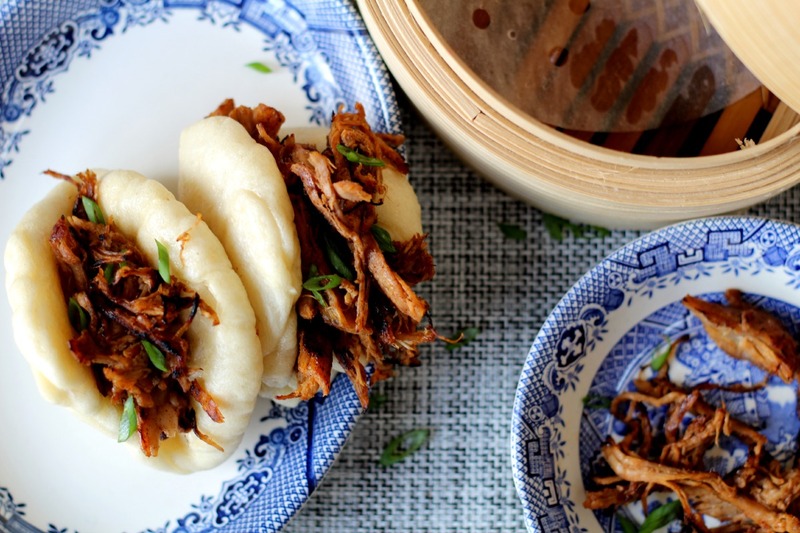 I have been wanting to try steamed buns and this looks like a fabulous recipe to try them out with. They look heavenly! These looks delicious! What can you substitute Lard for?